I'm so glad I was able to fit in a few more miles before 2012 is over. 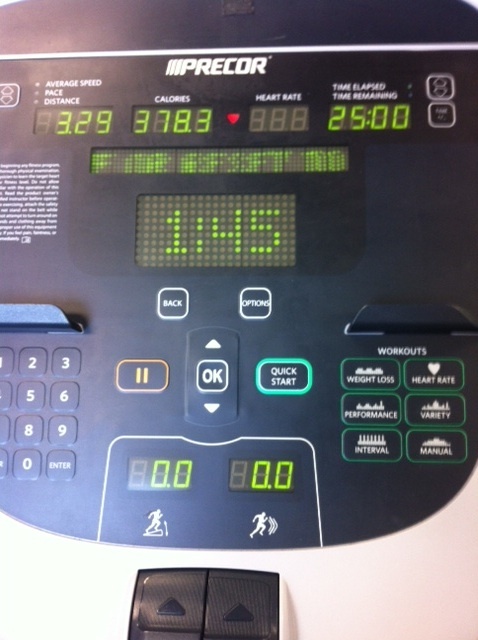 Mason and I headed to the YMCA where he played in the child watch area and I pounded out 3.1 miles on the treadmill. Not my fastest time but I'll take it. My legs are still a little sore from a 7 mile run I did on Saturday. 7 miles in 57:56 minutes. I wore my compression socks and I think they helped keep most of the soreness away. Saturday night was a fun date night for Ryan and I. We had drinks and dinner at Capital Grille, one of my favorite steakhouses. Let's see ... 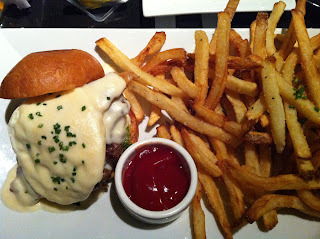 I skipped running on Friday but did have an awesome cheeseburger from Cowfish. Ryan and I split a sushi roll and the cheddar bacon cheeseburger complete with a ton of crispy shoestring French fries. And finally on Thursday I squeezed in a treadmill run while Mason played in daycare. Hope everyone has a fun and safe night. See you in 2013! I guess I should clarify that the tears came from Mason and not me. After Mason's nap we got ready to head to the YMCA for some daycare and treadmill action. 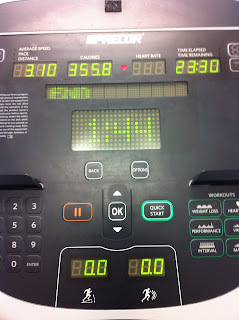 I was feeling sluggish so I started the treadmill at 7.0, and increased the speed by 0.1 every 2 minutes. Once I reached 8.0, I randomly increased the speed every 30 seconds or so. Talk about some negative splits! By the time I went to rescue Mason from the daycare area he was crying. 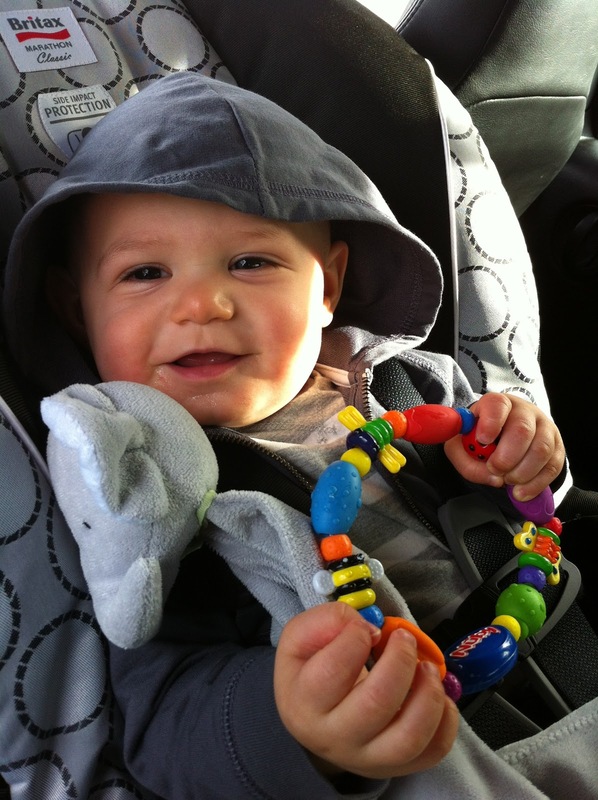 I think the maximum amount of time he will be content in daycare is 30 minutes. Looks like I'll have to save my longish runs for the weekend. My reward (or lunch) was a yummy veggie burger topped with pepperjack cheese from Kickstand. Day 4 of my run streak! I hope everyone has enjoyed their holiday. I know we had a blast celebrating Mason's first Christmas. I was even lucky enough to score an awesome gift from Ryan ... A pink Garmin Forerunner 10. Since Mason tried out all of his new toys today, I figured I should do the same. I took the world's shortest jog around our neighborhood just so I could wear this watch. Day 3 of the running streak. I even wore a throwback 5k shirt from my days in Orlando, Fl. Stays together. Or something. Can you use gym as a verb? After Mason woke up from his nap, Ryan and I took him with us to the YMCA for some exercise. While Mason hung out in daycare Ryan and I ran some miles on the treadmill. Now it's time to get our big Christmas Eve meal started and finished! After taking an embarrassingly long time off from running, I headed to the YMCA today. I was hoping to run a short 2 miles on the treadmill, but arrived a little too late. I was under the impression they closed at 6pm on Sundays ... Instead the sign said 5pm. With only 10 minutes until closing time I did my best to make those minutes count. 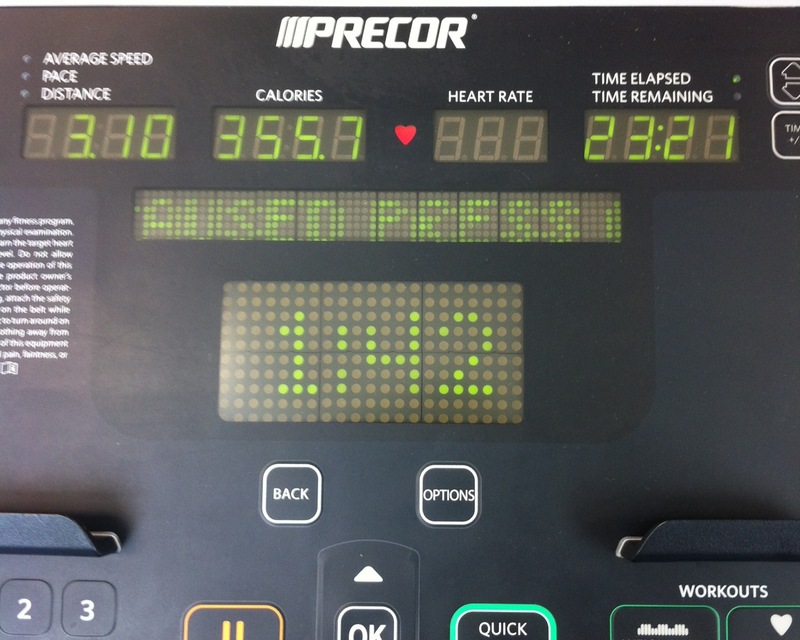 I ran 1.3 miles in 10 minutes, about 7:41 minutes/mile as my pace. Sigh ... Really wish I had more time to do a little more. Looking forward to finishing the year off with 8 more days of running (fingers crossed). I hate running outside if it's the slightest bit cold. Especially if I'm pushing Mason around in the BOB .. Babies shouldn't be exposed to those conditions right?? Anyways I've found myself running on the treadmill at the YMCA a lot more lately. 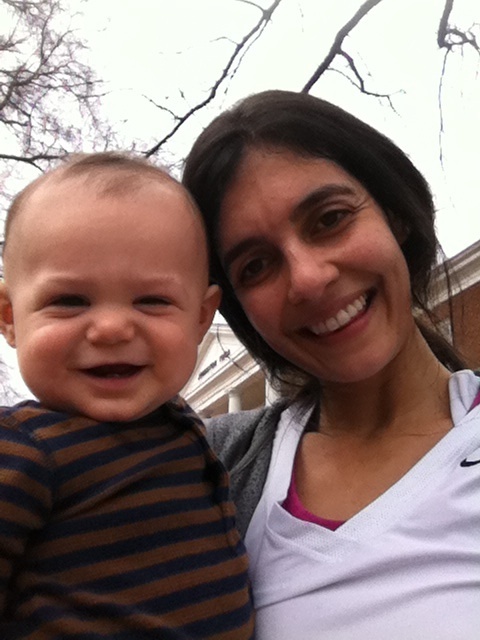 It's the perfect way to knock out a few miles indoors while strangers watch my baby for me. Yesterday I tried to spice up my run by increasing the speed 0.1 every 1:30 minutes starting at 7.0. 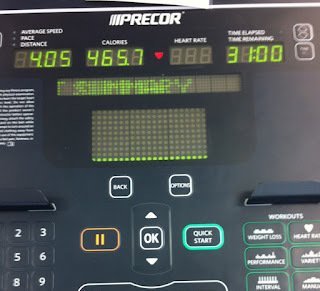 Once I reached 8.5 I reduced my speed by 0.1 instead until I completed 4 miles. The act of having to remember to increase my speed every 1:30 minutes helped to distract me. Plus I was able to keep some "gas in the tank" to run a little further than my usual 5k. And now here's a picture of Mason sleeping in the BOB on our porch. Of course he fell asleep during the last few minutes of our walk and I couldn't bear to wake him. Check out that pouty lip! on Friday I ran another one of my treadmill 5k's while Mason hung out in daycare at the YMCA. 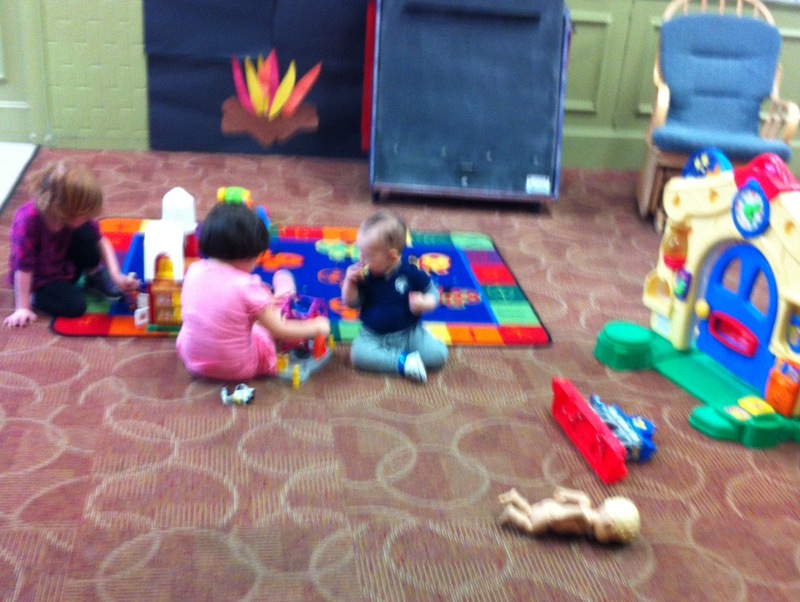 I love that Mason was playing with the older girls ... or at least staring at them while they played. I knew I wanted a burger for dinner, so I suggested to Ryan that we walk to a local restaurant for dinner. I hadn't tried the burger yet at the Peculiar Rabbit so our choice for dining location had been made. Oh boy was this burger messy to eat! 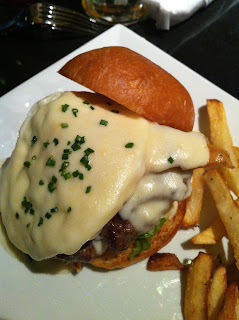 Between the Mornay sauce (which I had to idea what it was when I ordered this burger) and the over easy egg, there was just sauce dripping down my hands. I couldn't put down my burger for fear of it completely falling apart. So I ate it - quickly. And I wasn't disappointed in the taste of the meat at all. I did have a few issues though, mainly with the size of the burger. I liked it and wanted more of it and was sad that it was such a small size compared to other cheeseburgers that are served locally. I would reduce the portion size of french fries in exchange for a larger burger patty. Or better yet make it actually taste like CHEESE sauce. It lacked any flavor whatsoever. 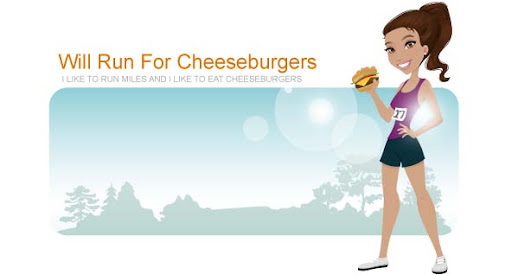 Or just smack a slice of cheddar directly onto the burger patty. Then we're talking! It was definitely a tasty burger, although much messier than I've experienced elsewhere. I would order this again, hold the mornay sauce, add a slice of any cheese they've got. Glad this place is within walking distance from my house. I was in such of a hurry to get to the gym this morning that I forgot to ... dare I say it? ... put on DEODORANT! lucky for me no one was really interested in smelling me so I think I got away with it. see? Mason didn't even care. He was too busy looking hooooooood. Finally. A fast(er) 5k. I started the treadmill at 7.0 and increased the speed by 0.1 every minute. Once I reached 8.7 I began to decrease the speed back to 8.5.
looking forward to doing a longer run later this week ... and I'll try to remember the deodorant this time. I've gone to the gym twice so far this week! Looks like someone is getting 1/10th of their gym membership value. Ha. 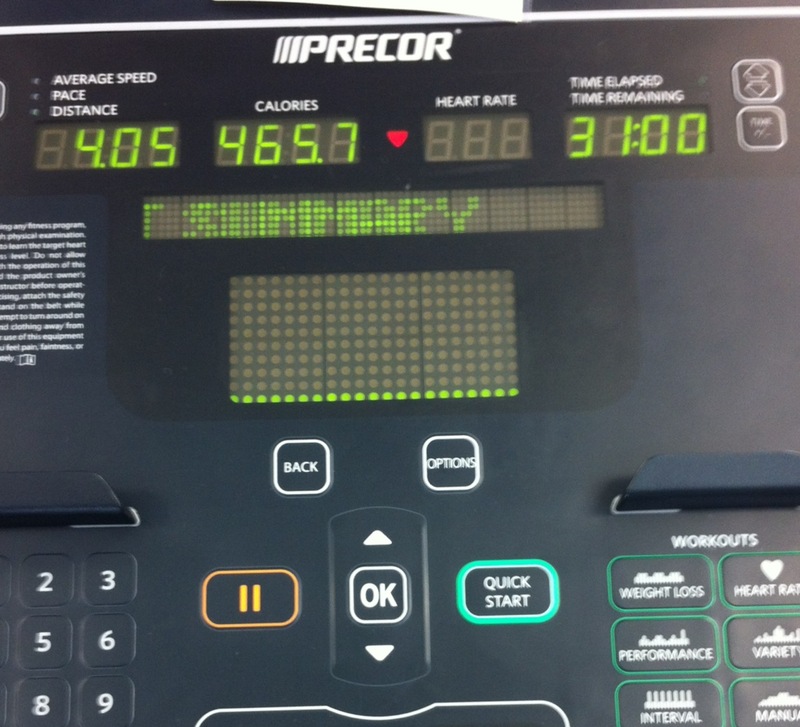 After dropping Mason off in childcare I darted over to the treadmills to get my run done. 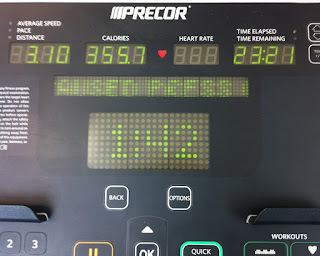 I really wish I could've ran just a little bit faster ... for some reason it really bothers me that my fastest treadmill time on DailyMile is from July. I did 3.08 miles in 23 minutes, which is a pace of 7:28 minutes/mile. New goal for Friday? I love that Mason doesn't mind taking pictures with me outside of the gym even though I'm super sweaty and gross. 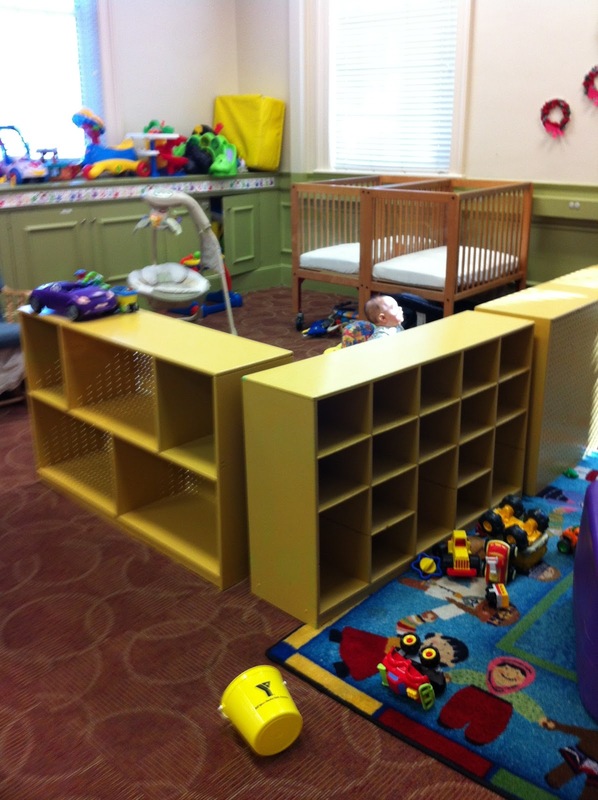 Mason spent time in the childcare room at the YMCA TWICE this past week. I left him alone for the longest time yet ... a total of 33 minutes. I spent 31 of those minutes running on the treadmill and the other 2 were spent walking to and from the room. When I went to pick him up I found him alone in a walker staring at the television because Elmo was on the screen. On the other side of the room were about 5 or 6 kids doing arts and crafts. Sigh. My child the loner. I was happy about my run ... I managed to get negative splits which always makes me happy. It's funny how much faster I've been running since leaving Mason alone in the childcare room. It's like I'm in a huge hurry to get back to him in case he has a breakdown. 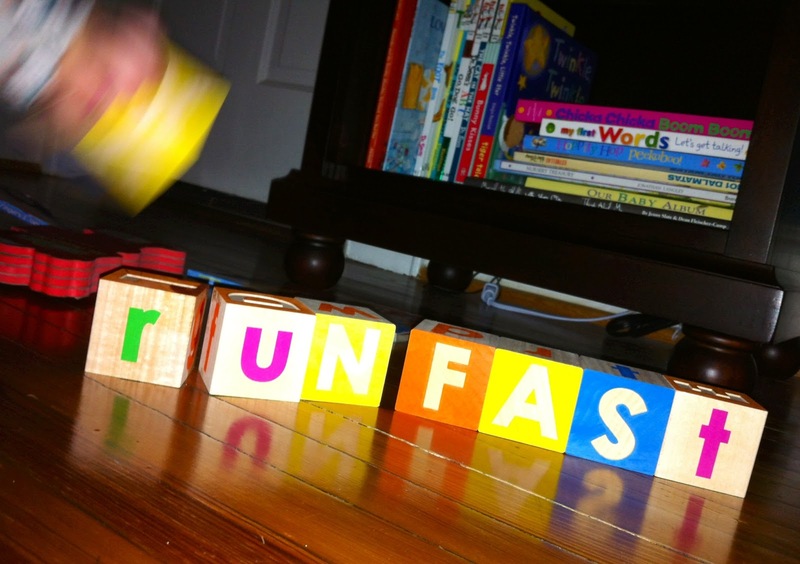 Once we got home Mason had some words of wisdom for me ... Run Fast. Will do son, will do.